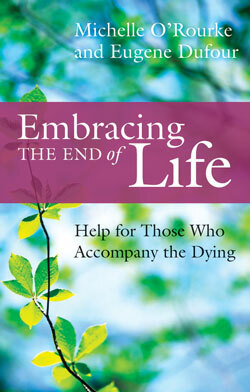 A compassionate guide that will enrich the spirit of all those who journey with the dying. Embracing the End of Life offers caregivers practical tools and guidance to ensure that the journey through aging and the end of life is dignified. Equally helpful for family members or health care providers, Embracing the End of Life is filled with inspirational stories. It explores important issues including loss, suffering and spiritual care, while considering aspects of dying well, caring well and grief. Questions provided in the book help caregivers examine their own beliefs about dying so they can help others who face these difficult issues. Embracing the End of Life is a valuable tool for understanding the special needs of those in the final stage of their lifeʼs journey, and assisting them to live life as fully as possible until they breathe their last. Michelle O’Rourke RN has a background in emergency nursing, hospice palliative care, parish nursing and pastoral ministry. A frequent speaker and educator, she helped design and open the ten-bed Chatham-Kent Hospice in 2016 and is the author of Befriending Death: Henri Nouwen and a Spirituality of Dying. (Orbis). She is active educating, supporting hospice care, and assisting the Henri Nouwen Society with new materials and retreats for caregivers. Eugene Dufour is a clinically trained therapist and international speaker on the topics of compassion fatigue, critical incident stress debriefing, bereavement, hospice palliative care and pastoral care. The former Executive Director of the Bereavement Ontario Network, he currently works as a therapist with the Star Family Health Team in Stratford, Ontario. To order, contact Michelle, the publisher, your local book store, or through Amazon/Indigo et al. Also available as an ebook. 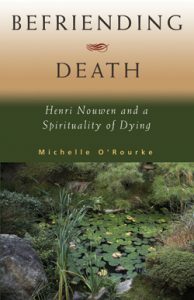 “I believe that this book makes a significant contribution to the literature on the care provided by those who accompany the dying. For the good of the dying, and for the benefit of their care partners, it deserves the reader’s careful attention.